To be a global leader in championing wellbeing for our faculty, staff, students, and community members, we must work together, embracing wellbeing in our campus culture, promoting and supporting wellbeing in both large and small ways, and helping one another address challenges. 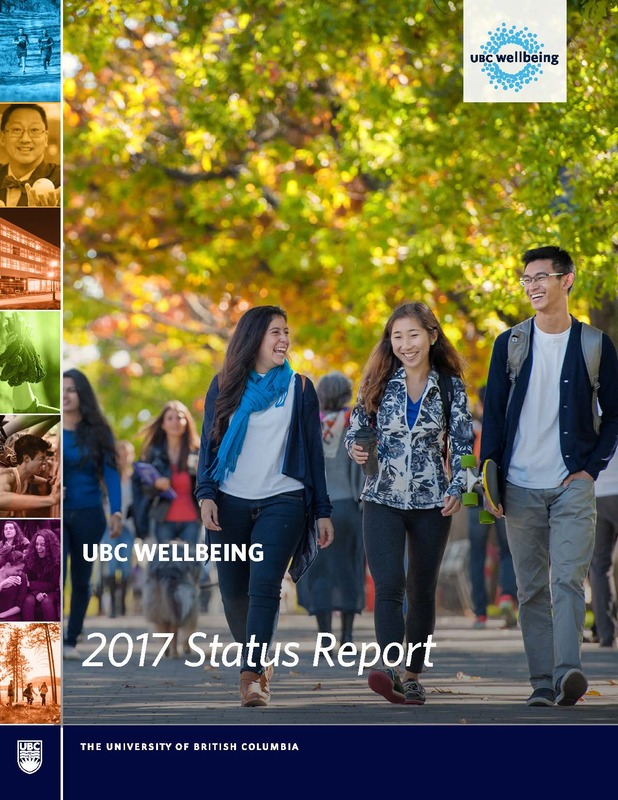 It is this strategic, collaborative, system-wide approach that defines UBC’s approach to wellbeing. It is not the effort of a single unit or department, but something we create collectively, with everyone contributing to making UBC a better place to live, work, learn and play. The UBC Wellbeing Executive Leadership Team provides oversight and decision-making support to ensure that UBC moves toward becoming a wellbeing-promoting university, embedding health and wellbeing in all that we do: into everyday operations, business practices, and academic mandates. The Wellbeing Advisory Committee is made up of a dedicated group of academic leaders, senior administrators, and student executives on both our Vancouver and Okanagan campuses. They represent leadership across portfolios at UBC and are a driving force in supporting wellbeing as a priority on our campuses, addressing why wellbeing matters, and recognizing how it can be better integrated into the strategic, academic, and operational work of the university. The Advisory Committee typically meets quarterly. Comprised of student, faculty, staff, and community stakeholders from both campuses, committees support our Wellbeing Priority Areas. Each committee develops a "Framework for Action" to help guide goal setting and facilitate cross-cutting initiatives in each area. For “Built & Natural Environments” and “Social Connection,” efforts are already underway within key supporting units, and the need to create a separate committee is currently under review. Interested in learning more about championing and supporting wellbeing in your department or faculty? UBC offers a number of resources and services to support your own wellbeing, including counselling, benefits information and health and wellness programs. If you are looking for tools and resources to help better integrate wellbeing into your teaching, learning or workplace environment, please visit the Tools and Resources section for a variety of communication resources, workshops and classroom supports. The bi-monthly Wellbeing Round-up email contains wellbeing-related news from across our campuses. Contact gabriella.scali@ubc.ca to sign up. Check out the work happening across our campuses to support faculty, staff and student wellbeing.